I love my girlfriends. I love doing life with friends who “get me.” I love having tangles of conversations over hot coffee that are stranded together with light-hearted laughter, rich revelations, loads of love, treasures of time, and gobs of grace. Though sharing beautiful life-moments is always fun, some of the most powerful blessings of friendship for me have been found in broken places. In the trenches. Those places where our troubles and fears scream loudly and long to be quieted by the understanding heart of a friend. Times when we rise up to encourage one another with God’s promises, share reminders of His truth, extend challenges to believe, offer prayers for problems and speak hope to a sister who’s hurting. A few years ago, after a long conversation with a girlfriend who was in a painfully broken place, I was burdened. Heavily. Her shared-pain had become my pain. I ached for her to experience the hope of Christ in and through her hurt. Though she knew the Lord, she felt like her prayers were falling on deaf divine ears. She needed me to listen, to cry with her, and to point her right back to Jesus. As I prayed for my friend and considered her burdens, I was inspired to write a song of encouragement. I later co-wrote a song with her in mind. I’m not sure where this message of hope finds you. Sometimes we just need to be reminded that God cares and that He is compassionate. Sometimes we just need to be reminded that God sees us, knows us, hears us and loves us.That He is faithful, powerful and never wastes a hurt. Perhaps you need a word of encouragement today. Perhaps you know a friend who needs this word. The best thing we can do for our friends is to love them and point them to Jesus. The song I co-wrote is called Healer of the Broken. Read the lyric and then click the link below to listen to the song. Turn on your speakers and CLICK HERE to listen to the song Healer of the Broken. Dear Lord, Thank you for reminding me that You hear the cries of your children and that You are a God who loves to bring beauty to our brokenness. Please meet me where I am today and give me the grace to grow through these trials. Galatians 6:2 tells us to, “bear one another’s burdens.” What or who comes to mind as you read this? Read and contemplate the following Scripture passage: “The Lord is close to the brokenhearted.” (Psalm 34:18) How does this make you feel? 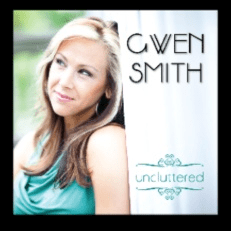 The song Healer of the Broken is featured on Gwen’s Uncluttered CD. You can download the song from iTunes or Amazon– or order her CDs on www.GwenSmith.net.